Within only one day, the entire allocation of 4,190 Jeep Gladiator Launch Editions sold out. Exactly one week ago, Jeep announced details and ordering guidelines for this limited edition 2020 Gladiator and brand enthusiasts heeded the call. The Gladiator Launch Edition was made available for pre-order on Jeep 4x4 Day, last Thursday, April 4. Buyers had to place their initial orders online before being redirected to a local dealership to complete the transaction, which totals $60,000. The standard Gladiator carries a base price of $33,545. Those who managed to successfully place an order were automatically entered in the "Find Your Freedom” contest. The winner will receive $100,000, which Jeep estimates to be worth one year’s salary, so they can take 12 months off to journey around the country to enjoy the Jeep outdoor adventure lifestyle. Contestants will now need to submit a personal "Gladiator” video that will be judged by Jeep and wounded warrior and US Army veteran Noah Galloway. Aside from the chance to win $100k, what else does the Gladiator Launch Edition offer? What makes it worth $60k? 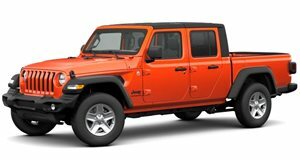 For starters, it’s based on the top-of-the-line Rubicon trim, itself carrying a base price of $43,545. But the Launch Edition tacks on a unique forged aluminum tailgate badge, 17-inch Mid Gloss Black aluminum wheels, and 33-inch Falken Wildpeak All-terrain tires. Inside there’s a wrapped instrument panel mid-bolster painted in Monaco silver, and black leather seats with red trim stitching. Buyers can choose from Black, Bright White, Billet Silver Metallic, Firecracker Red, and Granite Crystal Metallic for exterior colors. Under the hood is the 3.6-liter Pentastar V6 producing 285 hp and 260 lb-ft of torque, and it can be paired to either a six-speed manual or eight-speed automatic transmission. Built in Toledo, Ohio alongside the Wrangler, the Gladiator will arrive in dealerships across the US in the coming few weeks.